Sambar (சாம்பார்) is the most popular south Indian preparation that is eaten with rice or with tiffin items like idly, dosa etc. In most households, sambar is made at least two to three times a week. *Tomato, ash gourd, yellow pumpkin, brinjal, drumstick, ladies finger, carrot, capsicum or sweet potato may be used, either alone or in desired combinations. It is preferable to use radish alone as it has a specific flavor. Method: Wash toor dhal well, add 400 ml (two tumblers) of water, and pressure cook for 6-7 minutes (6-7 whistles). Soak tamarind in warm water. Heat oil in a kadai, add mustard seeds, when they start to sputter add split urad dhal, jeera and methi seeds; fry till the dhal turns golden brown. Add the onions and fry till they become transparent. Now add the cut vegetables and required salt. Cover and cook on low flame. Meanwhile, squeeze the tamarind and extract the juice. Add the sambar powder, dhania powder and jaggery to the tamarind juice, mix well and keep aside. Once the vegetables are done, add the tamarind juice mixture and bring it to boil. Allow the mixture to boil for 1-2 minutes. Mix the dhal using an ordinary hand blender or a ladle till it is soft and uniform in consistency. Add the dhal to the boiling kuzhambu and mix well. Add required salt and bring it to boil. Switch off the fire. Garnish with curry leaves and coriander leaves. Serve hot with rice and curry/kootu/appalam. Tip: If the sambar is watery, you may add a mixture of 1 teaspoon gram flour in a ladleful of water to the boiling sambar. Add slowly, while stirring continuously. This will increase the consistency of the sambar. 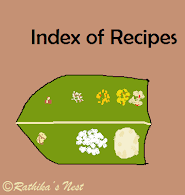 Tip: Jack fruit seeds may be used to make sambar. Dry the seeds in Sunlight well. Pound them lightly using a pestle. Now the thick whitish outer coat can be easily peeled off. You will have to pressure cook the seeds (brown in color) before adding to the sambar. They give a distinct favor to the sambar.